Rimac may have only been on the motoring scene since 2009 but don’t let its relative newness fool you: the company has been making some big waves in the all-electric hypercar world. Released in 2013, its first production model was the Concept One, a 1,288-hp sports car capable of category-leading performance and a 375-mile range. Only 8 were built, 1 of which Richard Hammond ended up destroying on The Grand Tour. Thankfully he wasn’t hurt and the car was not to blame, while the publicity actually helped Rimac get some exposure. 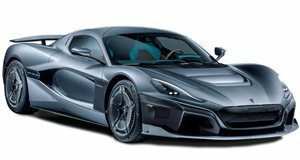 Rimac's latest creation is the C-Two, which boasts vital specs that read like something out of a futuristic concept vehicle destined for production in 2050. The power output is a claimed 1,914-hp and it makes a Chiron humbling 1696 lb-ft of torque. That’s enough to give the Rimac a 0-60 mph time of 1.85-seconds (with a one-foot roll-out) and the kind of in-gear acceleration that is measured in blinks. Most electric vehicles tend to suffer from a major drop-off in acceleration at higher speeds, that’s not the case with the C_Two. It features a pair of two-speed gearboxes at the rear which allow it to make the most of its huge power and reach a claimed 258-mph top speed. The front wheels have single-speed gearboxes of their own and each wheel has its own electric motor which means huge acceleration in even slippery conditions and the ability to actively manage the amount of power each wheel receives. Rimac Torque Vectoring (R-AWTV) replaces the traditional traction control and stability management systems employed on other vehicles. This setup can apply power in precisely metered amounts to each wheel and allows the car to behave like a driftable sports car one minute or offer all-wheel-drive traction the next. The battery capacity is an impressive 120kWh; liquid cooling keeps the 6,960 cells at optimum temperatures even under full acceleration conditions. Rimac claims that the C_Two will complete two full laps of the Nurburgring with no discernible drop in performance. The battery pack can be recharged with a fast charger to 80% capacity in under 30 minutes and a 402-mile range is also claimed. Exact details are not yet available so we will have to wait for the real-world figures to see how these claims stand up. The carbon-fiber monocoque features a bonded carbon roof and the crash structures are a combination of carbon fiber and aluminum. The car also features active aerodynamics which adjust to provide the optimum cooling and downforce when required. In low-drag mode the C_Two posts an impressive 0.28 Drag Coefficient. That is unless the rear wing activates to act as an airbrake or when it is aiding in cornering. High-intensity LED light units both front and rear provide superb lighting ability and each have an integrated cooling system to keep the 58-LEDs cool. The bodywork is perhaps not quite so distinctive as the car that it clothes. Interesting design features do lend it a purposeful look but it is the forged alloy wheels with their aerodynamic design that is the first thing to catch the eye. They are designed to smooth the airflow along the sides of the car and the tires themselves are a custom design made in conjunction with Pirelli. The interactivity between man and machine has also been taken to the next level. There is no key for example. Instead the driver can interact with the vehicle with voice control, facial recognition and a graphical interface. An integrated telemetry system with over 500 channels allows for the detailed assessment of the cars behavior. Driving aids have also taken a big leap forward. With rival EV companies such as Tesla incorporating many cutting-edge autonomous features into their cars, the C_Two also features an advanced AI-enabled driving system. This system assesses the road conditions and can change its responses based on weather conditions. Some of the onboard features include collision risk prediction allied to automatic braking and evasive control, blind-spot monitoring, lane-keep assist and fully adaptive cruise control including traffic pilot functionality. In all it will offer level 4 autonomy. How it does this is thanks to a veritable electronics shop worth of equipment. The system comprises of eight cameras, two lidar sensors, six radar emitters and twelve ultrasonic sensors. Add to this a very precise global positioning system and Rimac claims that the C_Two may well be the most sensitive and connected series car in the world. With so many sensors and computers assessing everything in and around the car, one interesting feature will be something Rimac calls the ‘near gaming experience.’ This refers to the function whereby certain racetracks can be loaded into the car and a ‘driving coach’ will then be able to offer advice on racing lines as well as braking and steering input. A co-driver display will combine graphics with on-board data logging to allow passengers to put real-time numbers to their terror. When not in a racing mode the C_Two is designed to offer comfortable accommodation for two occupants and their luggage. The gullwing doors incorporate the lower sills into their structure so entry and exit are made far less clumsy than in other super cars. The rear trunk is compact but can be custom configured and there are a number of storage solutions inside the cabin itself, including a wireless phone charging receptacle. The infotainment interface uses Rimac’s own design and promises to be intuitive and convenient to use. While most manufacturers are still offering glimpses of their upcoming EVs, the C_Two looks far closer to reality with production of the first example set for 2020. A total of 150 units are planned this time, all of which have already been pre-sold at a rumored $2 million a piece. If the final product is as good as the numbers suggest, it is not only the upcoming Tesla Roadster that has something to worry about. The C_Two promises to change the meaning of the word ‘fast’ as we have come to know it.